WHERE TO SLEEP ON FLORES? 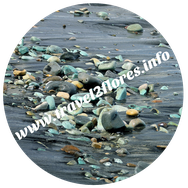 To fall to the point: most hotels on Flores are not of the international standard and many of them are not on hotel bookingsites, however it is still getting better these days. Outside Labuan Bajo many hotels are basic and simple but nowadays most of them have hot water (10 years ago we still had to struggle with a bucket of hot water heated for guests by the hotelstaff) which is a basic need in mountain villages where mornings, thus water can be very cold. For the months June, July, August and September, during Christmas/New Year and the week before and after Idul Fitri it is wise to book in advance. Rates change from time to time and are not always according to what you get. If possible try to book via one of these sites. Traveloka and Nusatrip are Indonesian based and have sometimes more options for booking hotels on Flores than other sites. If you cannot book via bookingsites try to make a reservation via email, however sometimes communication via email is slow (you have to wait for a few days or you don’t get an answer at all). Better is to communicate via a mobile number (if available) with sms or even better via Whats App, Line or Messenger so communication will be quicker and more interactive. Finally, it is not easy to recommend a hotel as standards and facility wishes for everyone are different. I personally like a hotel that is not too big and where I can sit in front of the room in a nice garden. WiFi, aircon (except in mountain areas) and clean is a must also. I pay an average of Rp 400.000 for a room on Flores. In places like Labuan Bajo, Bawaja and Moni prices sometimes increase in the tourist season. The semana santa in Larantuka, the week before Easter you need to book at least 6 month in advance and expect to pay a lot more than published rates. In the photo sector you will find a few pics of hotels. To avoid misunderstandings: there is no benefit in relation to these photo’s. 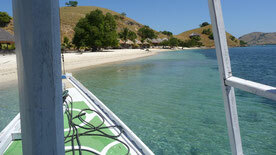 It is just to give you an idea of accomodation available on Flores. I selected around 100 hotels for you here below in alphabetical order of towns and villages. Although checked by myself if possible the information is not always complete or up to date. Rates, telephone numbers and email adresses can change. If there is any trouble to contact hotels please contact me. Aimere is useful for the crossing with ASDP to Waingapu on Sumba (on Friday, departure 07:00 am, 9 hours) or if you come back from your Belaraghi trekking. Aimere is 1 hour drive from Bajawa on the southcoast. So it’s hot an therefore no need to stay there; you better enjoy the cool nights in Bajawa. or at the guesthouse 7 kilometers further west in Wae Lengga (Manggarai Timur). A new but simple place in Aimere ritght at the beach in a nice garden. Rooms come with fan and start at Rp 250.000 - Rp 350.000. The capital of Ngada situated in the mountains is a nice place to spend a few (cool) nights. In the area are many traditional villages. From June to September finding a vacant room can be difficult. Book in advance. This new hotel (april 2017) is on the outskirts of Bajawa perched against the hill. The large rooms on the first floor are the nicest with seats in front of your room and views on Ebulobo Volcano near Boawae. It is a 10 minute walk to the centre of town or 20 minutes to the tourist area (eg hotel Korina, Edelweis restaurants). Bookings can be made via Booking.com or via email or telephone. As it is one of the few hotels which can be booked via Booking.com the hotel is full very often. Best choice in Bajawa. Rp 150.000. Good deal. Photo. One of the first hotels in Bajawa which has been expanded and renovated. Many roomtypes and rates. Double rooms vary from Rp 200.000 to Rp 375.000. This hotel often has rooms available when others on the mainstreet are full. This is the second and smaller edition of Edelweis hotel on the mainstreet (about 300 meters). More cosy and homestay like. Take the room on the second floor for more privacy and less cold than the rooms on the first floor. Rp 350.000. One of the newer and small hotels in Bajawa run by Dutch/Indonesian management. Rates Rp 350.00/Rp 450.000. Good Superior rooms. One of the new hotels in Bajawa. This small hotel is on the road to Bena 30 minutes from Bajawa. A welcoming and artistique interior and an amazing view (if there are no clouds) and 10 minutes by car from Bena traditional village. Rates start from Rp 650.000 or to be booked via several booking sites. This hotel is outside Bajawa on the road to Ende. 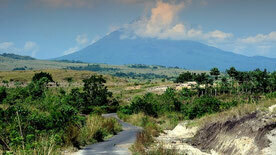 In fact the accommodation itself is a bit rundown but the attraction is the amazing view on gunung Inerie. You can stay in the village of Belaraghi for Rp 325.000 pp. You will stay with local people and you will be offered a ceremony according to local tradition. Belaraghi can be reached via the mainroad in Aimere in 45 minutes. Or from Bajawa (trekking for about 7 to 8 hours). Reservations can be done through your driver. Boawae is the base for climbing Mount Ebulobo. The small town has a few very basic guesthouses. Staying with the nuns. This hotel is in fact a monastery, 33 kilometers from Moni (Kelimutu). Unfortunately it is not the best option in the area, but you may spend the night here when everything in Moni is full. Rates start at Rp 275.000 for a good sized room with aircon and bathroom. Room no 202 is comfortable for Rp 400.000. Also to be booked via Booking.com but when booked directly much cheaper. The biggest and most expensive hotel in Ende. Rates: Standard Rp 550.000, Superior Rp 660.000, Deluxe Rp 770.000. One of the first hotels in Ende close to the airport. Next to Hotel Safari and the same quality. Rp 450.000. All prices are including breakfast in the restaurant on top op the hotel on a hill overlooking the bay of Ende. Rates Rp 275.000/Rp 295.000 for a room with aircon. A place to relax in front of the blue stone beach about 45 minutes from Ende. There are 4 simple guesthouses to spend the night for Rp 250.000. On Koka Beach (southcoast Sikka) are a few simple but clean bamboo homestays for around Rp 100.000 per person. Outside the weekends the beach is empty (and the homestays as well). Labuan Bajo has the most hotels in Flores - I guess around 300 or so including all the simple penginapan - and it seems almost every month there is a new one. Some of them can be booked via hotelbookingsites. There is a lot of choice for every budget. Summer can be very crowded so book in advance. Tip: many names of hotels and guesthouses in Labuan Bajo are more or less similar and often the have “Labuan Bajo or "komodo” in their name, don’t mix them up. Simple but adequate budget hotel in centre of town close to shops, harbour and pasar kuliner (nightmarket). Rooms are not too big and you can choose wether you want aircon or not. Rates: incl aircon Rp 300.000. A luxury hotel at Pede Beach which is outside the centre of Labuan Bajo. Rates start at Rp 1.600.000 if you book directly at the hotel. Better to book via Booking.com which is much cheaper. Budgethotel uphill in centre of town, poorly maintained but views are great. Rates around Rp 350.000 and difficult to book via bookingsites. Nice hotel along the seaside in central labuan Bajo. As the name suggest the hotel is on a hilltop overlooking the sea. Nice, clean and cozy run by two Dutch women. Rates start from R 450.000 with aircon. This hotel on the mainstreet is one of the oldies in Labuan Bajo. It has a great location (if not the best) as all rooms are located on the hill overlooking the bay of Labuan Bajo. You can choose between bamboo bungalows, cute but basic and fan only starting at Rp 154.000 or one of the airconrooms starting at Rp 420.000. In summer prices are higher. Gardena also owns a resort on pulau Seraya. Another basic hotel close to Chez Felix. In centre of town, simple but clean. Nice and quiet motel like hotel but a bit far of the action. However, the hotelstaff provides free transport to/from the towncentre. On the other hand, you are not in the middle of all the projects on the main street and around. Recommended. Large middle class hotel in the centre of town. Excellent and luxurious hotel at Pede Beach. There are a few resorts and guesthouses on the islands off the coast Labuan Bajo. On Angel island is a very luxurious resort starting at € 268 a night. The accommodation seems to be in so so condition. There ís accomodation on Komodo island but obviously not bookable and reserved for special visitors. Stay in Labuan Bajo or overnight at the boat. 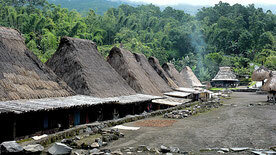 There is basic accommodation in Loh Buaya, the settlement where people start their visit of trek on Rinca. However, most people spend the night on the boat (or return to Labuan Bajo the same day). Seraya island Resort (bookings via Gardena Hotel, Labuan Bajo). For rates (including boattrip to/from the island) and reservations contact Gardena Hotel in Labuan Bajo. If you come to Larantuka for the semana santa, the week before Easter keep in mind to book in advance as far as possible and reconfirm frequently as Larantuka will be full. The alternative is to stay in Maumere at that time. Between the airport and (the best there is in) town. Two stories at the with a fence enclosed beach, good size rooms, nice garden, aircon, good breakfast. Advisable to book in advance. In towncentre opposite Pelnioffice. Brand new (may 2016). Rooms are a bit small but ok. Clean. Bathroom the Indonesian way (squat toilet). Good option if Asa or Sunrise is full and/or you want to stay in the centre of town. Simple and basic. Rates Rp 250.000 and up. A few kilometers out of town right on the beach and in front of Adonara island you will find a cosy place with some wonderful accomodation. You can choose between a boathouse, beach bungalow or a beach house for you and your relatives. Bookings can be made by Booking.com or directly via email of telephone. Prices start at Rp 350.000 for the boathouse. The bungalow is Rp 500.000. It is also the only and only divingcentre in Larantuka. Christopher is an experienced diver and his wife Maria takes care of the guests. You can hire a boat for Rp 500.000 a day. One hundred metres north from Asa, at the seafront. Bungalows set in a nice garden all on the groundfloor. A bungalowstyle resort east of Maumere on the road to Larantuka. The nice bungalows can be booked via Booking.com. Rates start at Rp 600.000. On the beach out of town on the road to larantuka. Similar to Sea World but cheaper. To be booked via Booking.com. Rates Rp 300.000-Rp 400.000. Very luxurious resort out of town on the road to Larantuka. Rates: Rp 450.000 for a "backpacker" room, bathroom outside. In the beautiful garden are 4 bungalows that are creatively decorated, however with Rp 1.250.000/a night prices are too high. Brandnew near Roxy Supermarket on Jalan Don Thomas. Rates start at Rp 395.000 for a good sized room with aircon, locker, tv. At this time the best there is in Maumere. To be booked via Traveloka. Rooms with aircon around Rp 300.000. Some aircons are right above the bed. Room V6 is the best option. A brand new Bali-like hotel on the outskirts of Mbay (on the road to Aegela/Ende) since May 2017. Standard room is Rp 335.000. De Luxe twin for Rp 390.000 or a De Luxe King, double bed for Rp 445.000. Executive Suite Rp 615.000 and De Luxe Suite Rp 725.000. WiFi is avaliable. This should be the best option in Mbay with facilities such as aircon and WiFi. However, Wifi is almost not possible as the signal is very low (whitin 5 days I only could use the internet a couple of times). Aircon is poor and as it is hot in Mbay you will still sweat from time to time in your room. Water is also a problem. A new hotel (january 2016) at the edge of town on the road to Maumere. Rooms look good. VIP with ac and tv for Rp 300.000/Rp 350.000. No WiFi. They have a huge list of "don'ts" and "dilarang" like no alcohol in the room and no unmarried couples in one room. This is the best hotel in Mbay. Rates for an aircon room are Rp 250.000 with a double and single. In Moni most of the accomodation are guesthouses and homestays with a few rooms only. You don't need aircon as nights are cold. Most of the rooms have hot water. For the months June - September book (far) in advance and be aware of high prices in July and August. The alternative is 45 minutes west in Detusoko in case everything is full, or stay in Ende. Prices for a room are not clear and seem to go up and down. In my opinion most homestays, guesthouses or lodges should be no more than Rp 400.000. These high room prices seem to be a Moni, Riung and sometimes a Bajawa thing. New homestay (2015) with two rooms. Rates were not clear for al long time. Now on Booking.com available for Rp 1.000.000 for some dates for example in July and August which is far too high. The normal price is Rp 450.000. Maybe less if you book direct at the hotel. This hotel has nice accomodation and is clear about prices. Double rooms are Rp 449.000, a tripleroom for Rp 650.000 and a family room for Rp 800.000. The only drawback is that they have quite steep stairs. Check their website. This lodge was under renovation in October 2016. I saw this guesthouse on the way from Maumere to Ende which looked great but untill now I didn't found any further information. There are a few very basic hotels in Reo which are not decent enough and downright dirty. As Ruteng is only 2 hours away (and much cooler) there is no need to stay there. This hotel has motelstylerooms in a garden. Nirvana offers 8 separate bungalows in a nice garden. Rates: double Rp 350,000, triple Rp 475.000, family Rp 600.000. Double with hot water Rp 450.000, triple with hot water Rp 550.000. Brandnew and clean rooms (end 2018) runned by a Flores/Dutch couple Armand and Maxime. Rooms are Rp 250.000/Rp 350.000 (low/high season). Small, simple and new and close to the harbour. An old and not so well maintained hotel close to the market and shops. Small and brand new (2018) with decent rooms. This hotel set in a nice garden is outside the centre with views on ricefields and mountains. A bamboo hut like hotel with many infomation and backpackers. Rates: Standard Rp 385.000/Rp 475.000/Superior Rp 550.000/De luxe Rp 660.000/Executive Rp 875.000. Roomrates here increase quickly (plus 12% in 4 month). For a standard room you get a better value at Susteran MBC, FX 72 or Rima. The most fancy (and most expensive, and best) new hotel set in a beautiful garden with rooms and bungalows in luxury countrystyle, a nice restaurant and a good location. Since the opening in 2017 prices have gone up rapidly. Rates in 2019 start at Rp 900.000 for a deluxe room. Also a suite available. To be booked via many websites. Beautiful but overpriced. The guesthouse is on the beach 7 kilometers beyond Aimere in a relaxed setting. Leko Lembo has a view right opposite Gunung Inerie in Ngada which is across Aimere Bay. It's a tranquil place set in a garden amongst the villagers. Wake up around 5 am to watch the sunrise.